Christian: But did you meet nobody else in that valley? Christian: It was well for you. I am sure it fared far otherwise with me. I had for a long season, as soon almost as I entered into that valley, a dreadful combat with that foul fiend Apollyon; yea, I thought verily he would have killed me, especially when he got me down and crushed me under him, as if he would have crushed me to pieces; for as he threw me, my sword flew out of my hand; nay, he told me he was sure of me: but I cried to God, and he heard me, and delivered me out of all my troubles. Then I entered into the Valley of the Shadow of Death, and had no light for almost half the way through it. I thought I should have been killed there, over and over; but at last day broke, and the sun rose, and I went through that which was behind with far more ease and quiet. As Faithful concludes the account of his journey through the two valleys, we see again the difference between Christian’s experience and Faithful’s experience. Faithful did not succumb to the same fears and temptations as Christian. For Christian the way was difficult and dark. He battled Apollyon in the Valley of Humiliation and was confounded with torments and terrors in the Valley of the Shadow of Death. Faithful encountered Discontent and Shame in the first valley, but “had sunshine all the rest of the way through” even through the Valley of the Shadow of Death. Sunlight is an important metaphor in The Pilgrim’s Progress. Earlier in the story, when Christian was in the Valley of the Shadow of Death, Bunyan described the rising of the sun as “mercy” to Christian. This mercy was a reflection of Bunyan’s own experience. In Grace Abounding to the Chief of Sinners Bunyan tells of a dream that he had when he was beginning to understand his need of salvation. The dream provided him ideas he later used to create the story of The Pilgrim’s Progress. In his account of the dream, he explains the significance of the sun. About this time, the state and happiness of these poor people at Bedford was thus, in a dream or vision, represented to me. I saw, as if they were set on the sunny side of some high mountain, there refreshing themselves with the pleasant beams of the sun, while I was shivering and shrinking in the cold, afflicted with frost, snow and dark clouds. Methought, also, betwixt me and them, I saw a wall that did compass about this mountain; now, through this wall my soul did greatly desire to pass; concluding, that if I could, I would go even into the very midst of them and there also comfort myself with the heat of their sun. About this wall I thought myself, to go again and again, still prying as I went, to see if I could find some way or passage, by which I might enter therein; but none could I find for some time. At last I saw, as it were, a narrow gap, like a little doorway in the way, through which I attempted to pass; but the passage being very straight and narrow, I made many efforts to get in, but all in vain, even until I was well-nigh quite beat out, by striving to get in. At last, with great striving, methought I at first did get in my head, and after that, by a sidling striving, my shoulders, and my whole body. Then I was exceeding glad, and went and sat down in the midst of them, and so was comforted with the light and heat of their sun. Now, this mountain and wall, etc., was thus made out to me—the mountain signified the church of the living God; the sun that shone thereon, the comfortable shining of His merciful face on them that were therein. The wall, I thought, was the Word, that did make separation between the Christians and the world; and the gap which was in this wall, I thought was Jesus Christ, who is the way to God the Father (John 14:6; Matthew 7:14). 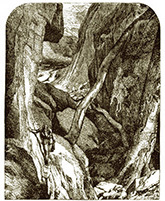 But forasmuch as the passage was wonderful narrow, even so narrow, that I could not, but with great difficulty, enter in thereat, it showed me that none could enter into life, but those that were in downright earnest, and unless they left this wicked world behind them; for here was only room for body and soul, but not for body and soul, and sin. As Bunyan notes, the sun gives both light and heat. The light signifies our understanding of God’s Word. We can see and think more clearly in the light of Scripture. “Your word is a lamp to my feet and a light to my path” (Psalm 119:105). Christian was confounded and needed the helpful rays of truth on his path. But when the sun arose, it was not just Christian’s mind that was helped. He had not just light but also heat and warmth. His emotions and affections were lifted with the smiling face of Christ. God’s Word was precious to him. He delighted in truth. Christian had forsaken the world to become a pilgrim, a follower of Christ. He was rescued and redeemed, cleansed and forgiven. He belonged to the Lord and now enjoyed the warmth of His presence. Does hearing and believing God’s Word impact you this way? Do the promises of the gospel warm your heart and stir your soul? We need truth to do more than just satisfy us intellectually. We need it to do more than just answer our questions. When the truth of all that Christ has done for us truly lands on us, it will do more than simply make us wise to salvation. It will warm and rejoice our hearts. It will stir and overflow our affections. It will move us and grip us in ways that resonate through our entire being. It will cause us to love God with all our heart and soul and mind and strength (Luke 10:27).